As soon as I saw this image from Crafty Secrets, I knew I needed to make a card with it for my dad. 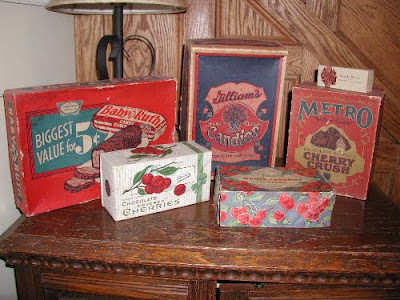 I started collecting vintage and antique candy boxes when I was in graduate school. 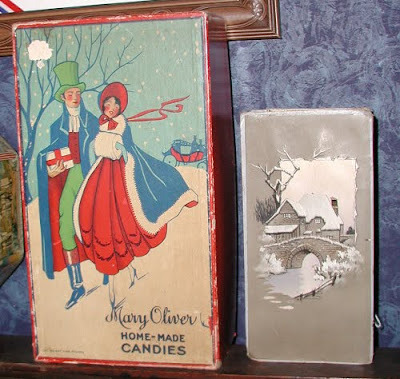 I was attending out of state and feeling a little homesick, when I came across an old Hershey box in an antique mall. It's the kind of box stock would arrive in at a drug store or soda shop. I told my dad about it on the phone, and that was just the beginning. So I thought I would share some of my candy box collection with you. Believe me when I say that this is just the tip of the iceberg. 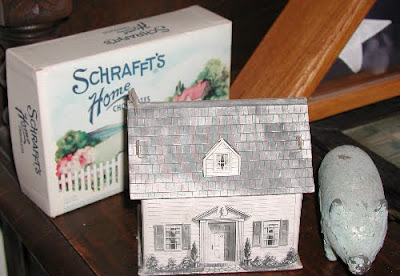 My dad is an antique dealer, and he keeps an eye out for these on every buying trip, at yard sales, estate sales, auctions, flea markets, etc. and gives them to me for Christmas, my birthday, Easter, Halloween...well, you get the picture! I don't keep all of them on display all of the time. I like to change them out with the seasons or holidays. The one on the left is the only chocolate box out of the group above. 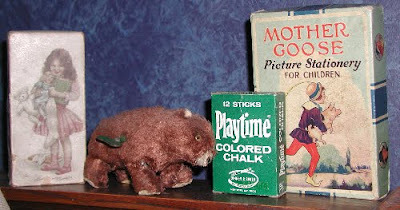 I'm generally a sucker for vintage things for children. The one on the right is dated 1914 and has Pittsburgh spelled without the "h". 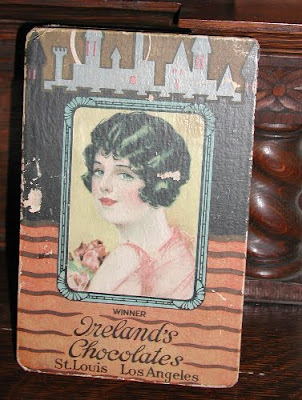 I have boxes from national brands & small chocolate shops (some no longer in business and some still going strong.) 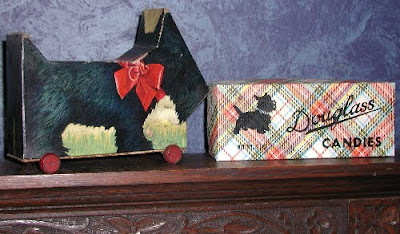 I have seasonal boxes, holiday boxes, quirky ones, and sophisticated ones. You can even learn a little history and geography from them. But mostly they are just plain sweet! Wow Marcy ... your collection is AWESOME!!! Thanks so much for sharing them with us!!! 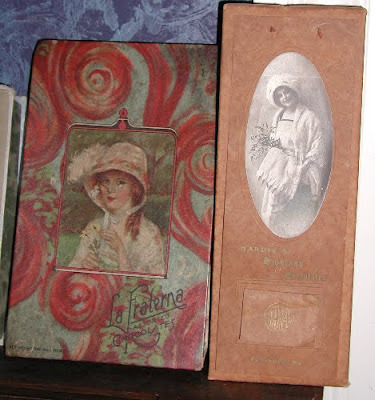 Of course I LOVE the very vintagey items but they are ALL wonderful! Good for you ... now I'll have to keep my eyes open and see what I see that you might like to have!! A very unique item to collect but I think they are awesome!!!! Wow, what treasures from your Dad! The fact that he is always looking for them for you and gifting them to you makes them even more of a treasure! I adore the one in the first photo with the roses, and then the ones with the ladies and the children steal my heart. Sigh. 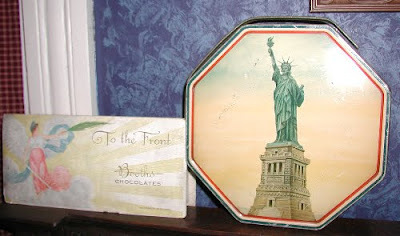 I so wish chocolate boxes and valentine boxes and all of those things were still made as beautifully! What a fantastic collection. I had no idea that such variety existed. What a fun hobby to share with your dad. I especially love the vintage ladies. I'll have to keep my eye out for these now. Your vintage card captures the feel perfectly.